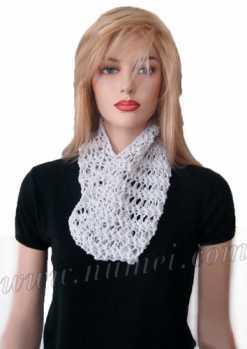 Beautiful lacy cowl knit with Costella, a soft, shimmery glitzy yarn. Rd 2: *(K1, YO, sl 1-K2tog-PSSO, YO), rep * till end. Rd 4: *(YO, sl 1-K2tog-PSSO, YO, K1), rep * till end. Work Pattern Stitch until piece measures approx. 8" (Note: If preferred, cowl may be knit in Pattern Stitch till it measures 9"-10").